I love brushes. I can't help but buy them. I managed to purchase a lot of mine through IMATS www.IMATS.net in the last 2 years. IMATS is fantastic. International makeup artist trade show. It's held in London for all those MUA's in the UK. You do not have to be a makeup artist to attend! All makeup lovers are welcome. The stalls sell makeup, beauty and equipment at trade prices. There are celebrity makeup artists that hold seminars that you can sit in whilst they carry out demonstrations etc. It's great! I always spend too much money there :( especially on brushes. Addicted! So, I have 2 brush belts. Both MAC. One is my backup which has my least favourite brushes in. The other is my go-to belt (above). My brushes include brands from MAC, Crown, Royal and Langnickel and Real Techniques. All of these brands have websites that you can purchase their stock online. 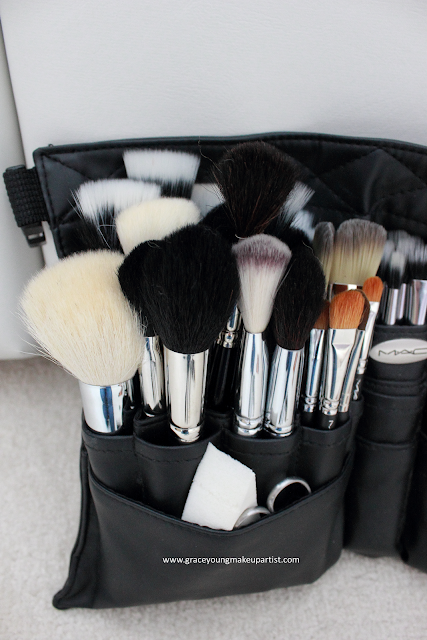 Personally, MAC is my favourite brush line. However, Crown are very affordable and still have fantastic quality bristles and handles to them. They have a wide range of brushes, styles of handles and different types of hair that you wish to use. I normally take as many brushes as I think I'll need for my freelance jobs. 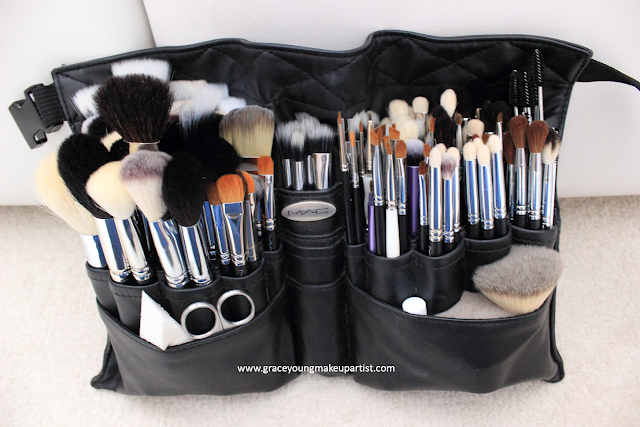 I put all my best brushes in the photo to show you guys my different branded brushes and how I store them in the belt. I do not normally carry this many otherwise they tend to dent the brush hair if too many are crammed in and it would be heavy to wear. 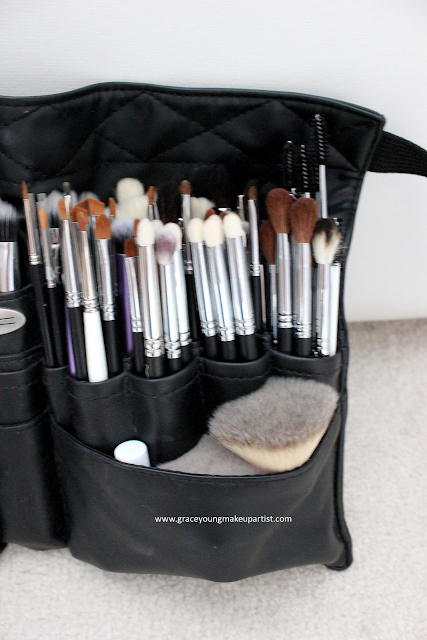 I tend to keep all my 'face' brushes (such as foundation, blending, contour and powder brushes) on the left hand side and all my eye/lip brushes on the right hand side (blending, laydown, precision, eyeliner and mascara wands). I always make sure I have sponges, small scissors and lip moisturiser in the bottom half in case I need to grab it quick. Here are a few of my all-time-favourite brushes. I bought the eye and face set from IMATS this year from the Real Techniques stand in London for my kit. When I got home that day, I heard that they were going to be stocked in Boots www.boots.com so I purchased another 2 sets for myself when they were released. These two brushes are my favourite from the collection, especially the one on the left. It blends out makeup flawlessly and gets into all the contours of the face. Easy to use and clean! 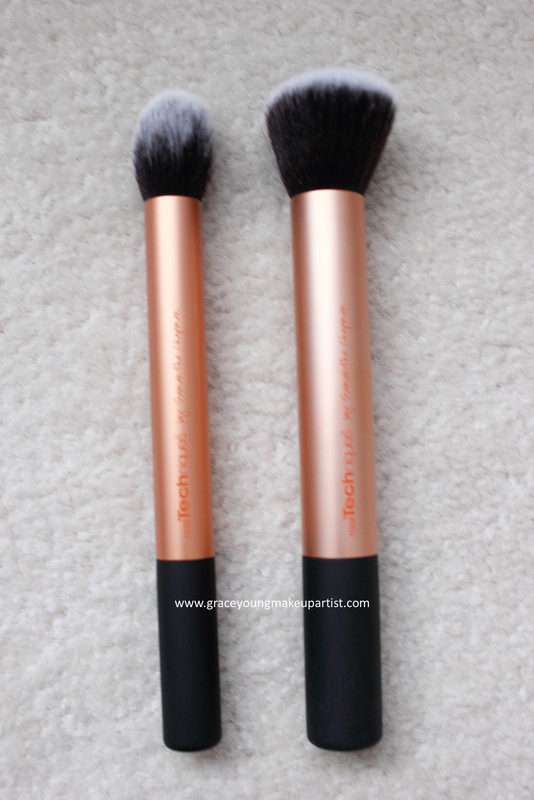 I always use this brush - for me, this brush is amazing for applying foundation, powder and cream product. It gives a flawless finish and buffs the product into the skin, making the products last longer. It makes the skin appear smooth and even. I have a few of these in my kit as I know I will always use them. However, they are quite pricey but well worth the money as they are a great applicator and clean very well. I hardly loose any hairs from this brush which is great and have lasted me for quite some time! I think that everyone has heard of this brush. Its amazing. I have 5 or 6 of these in just one belt! Great buffing tool, great laydown brush, blends amazingly and can be used for all types of makeup - not just for the eyes. I like using this brush for detailed blending in areas of the face when applying foundation to make the skin look airbrushed and perfect. Another fab brush. I use this to laydown eyeshadow, glitter or pigments and to apply dark shadow along the lashline or in the outer corners of the eye. This brush is great for contouring or sculpting the face as the angle of the brush sits perfectly into the bones of the face. I use this with powders or bronzers. The bristles of this brush are so soft and always spring back into the correct shape after washing. I always clean my brushes regularly for hygiene reasons. This also keeps them intact and last longer if you take care of them over the years. MAC brush cleaner is £9.50 online or in store. I either use that or a mild gentle shampoo if I have run out of MAC. MY favourite O.P.I nail polishes!